This post was brought to you by Sci Tech Discovery Center. All opinions are mine and may contain affiliate links. 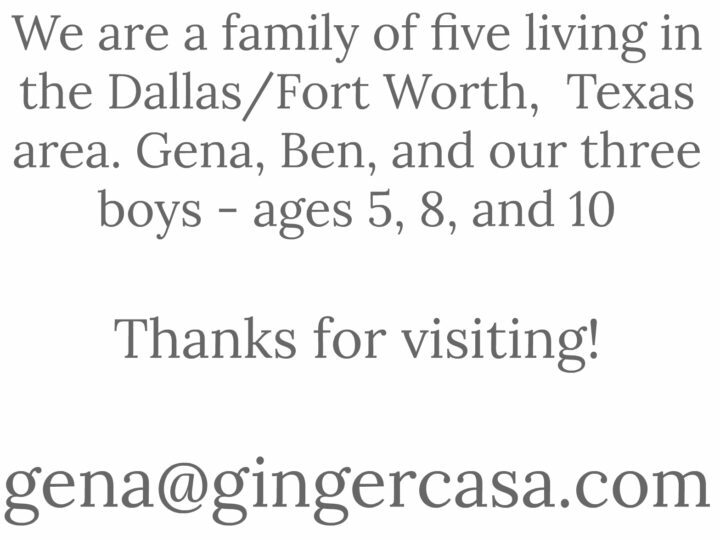 For more information, please read my full disclosure. The boys have always been go, go, go. They want to do everything, see everything, and explore everything that there is to explore. 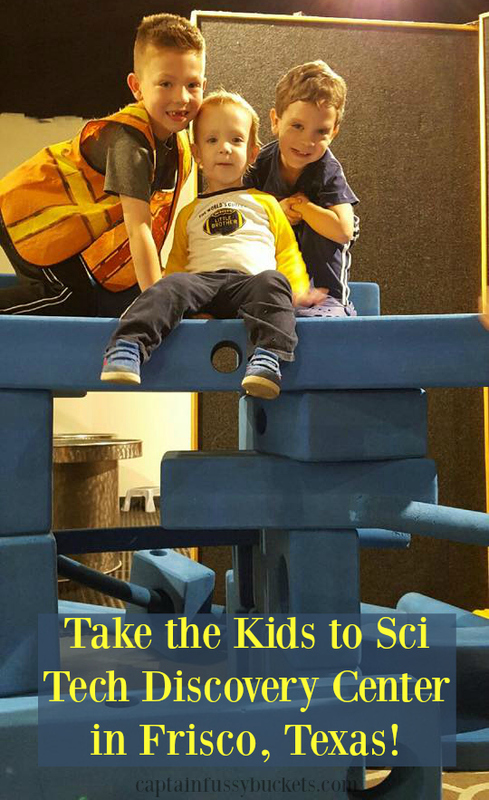 A few weeks ago, we took the boys to the Sci Tech Discovery Center in Frisco, Texas. 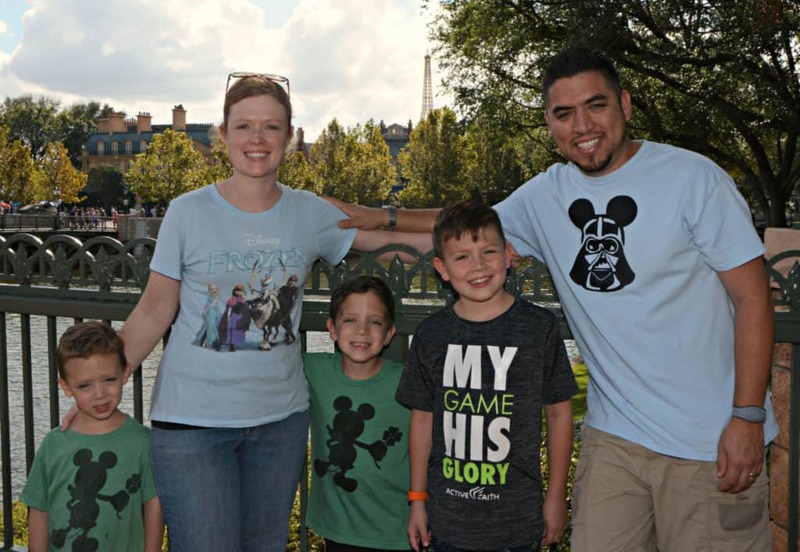 The wind was cool that day, but they needed to get some energy out, so this was the perfect family outing. 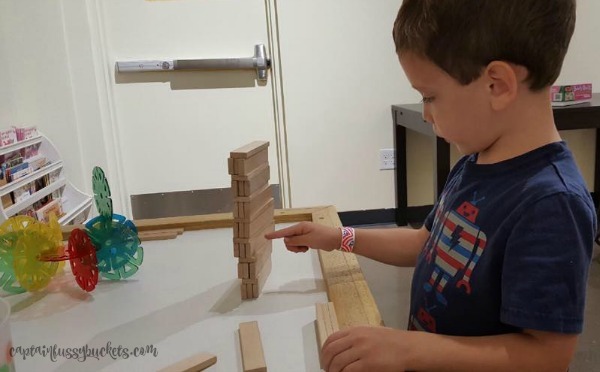 The discovery center is the perfect size for exploring different exhibits without having to walk everywhere. It is open and spacious, and we all really had a fun afternoon there. There is currently a fantastic exhibit at the Sci Tech Discovery Center. 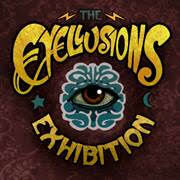 Eyellusions is full of family friendly fun and the neuroscience behind mind-boggling illusions that have been around for years. 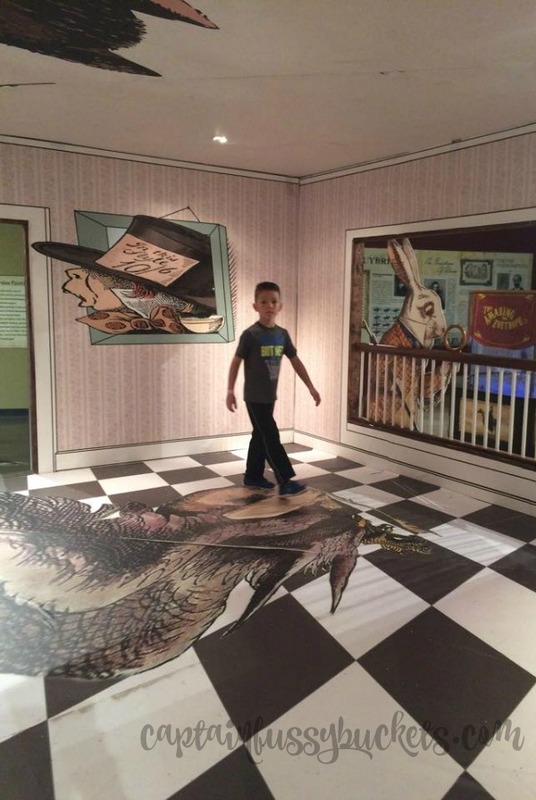 We discovered a time machine, Alice in Wonderland themed room, a fun zoetrope, and much more. 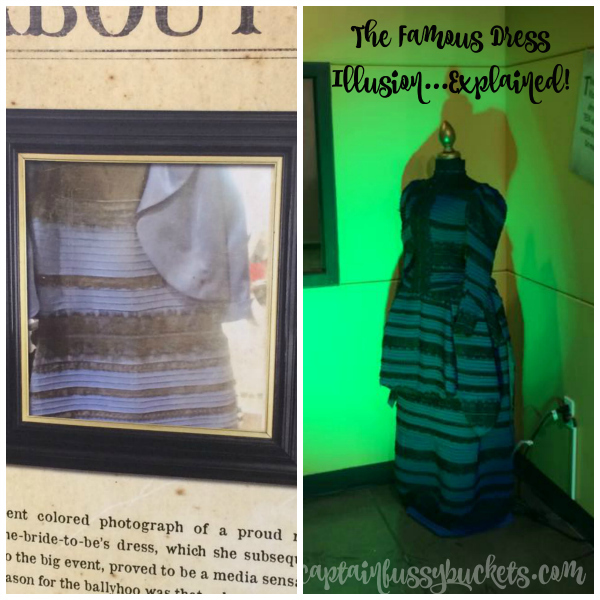 Upon walking in, you will see a display of a dress similar to the famous Facebook dress….where people were befuddled at how different people say the dress as different colors. Hubby and I also had fun with this "dummy" illusion! He sat in a chair a few feet behind me to creat this picture: Make sure to plan your trip to Sci Tech by January 3, 2016 to catch Eyellusions! 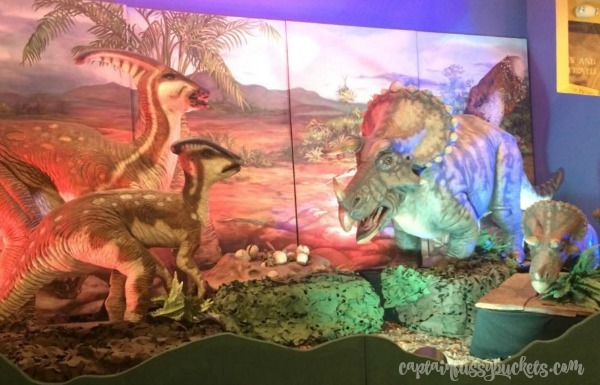 The boys loved this Dinosaur exhibit, complete with roars and animated dinos. The dino dig was also a huge hit! The boys were able to use brushes to "excavate" a dinosaur skeleton. 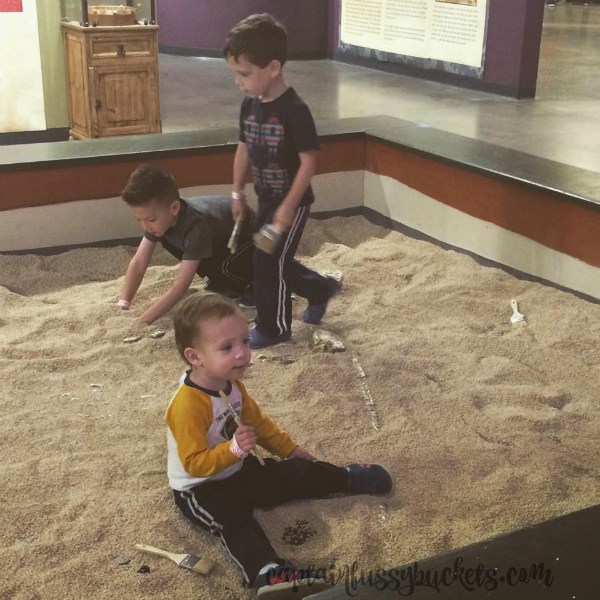 In the back of the Discovery Center, there are fun exhibits to explore. 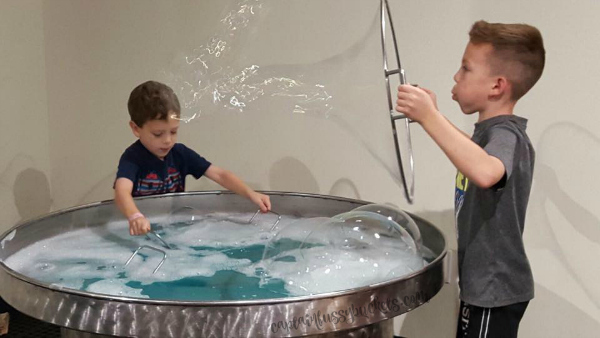 We loved the bubbles and learning about the different shapes and colors. D absolutely loved the different blocks and puzzles. There were large blue blocks (pictured at the very top of this post,) large wooden blocks, Legos, along with books and other fun manipulatives. We could spend all day in this area, alone! Visit the Sci Tech website for admission prices, exhibit information, and hours. Make sure to check out the special camps, story times, and information about having a birthday party at Sci Tech. 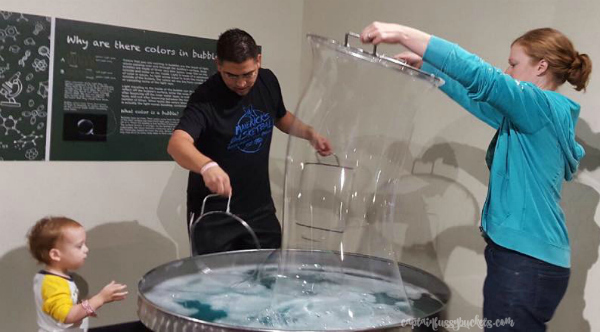 There is so much educational fun to be had in Frisco! Enter to win two tickets to Sci Tech below! 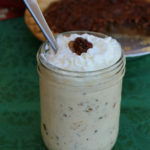 'Tis The Season For A Pecan Pie Shake!